Pitman Borough Hall is located at 110 South Broadway, Pitman, NJ 08071; phone: 856-589-3522. 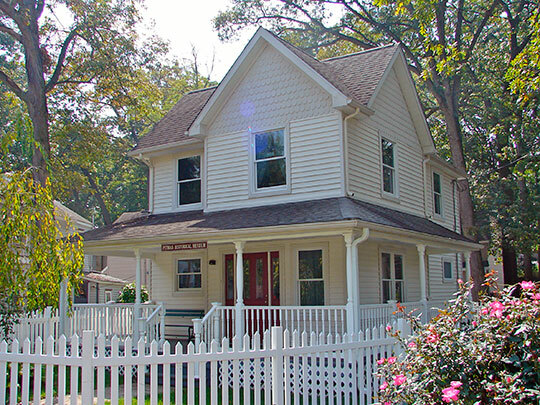 Photo: Pitman Grove Historical Museum, 130 7th Avenue, Pitman Grove Historic District, Pitman, NJ The Pitman Grove Historic District was listed on the National Register of Historic Places in 1977. Photographed by User:Smallbones (own work), 2010, [cc-by-1.0 (creativecommons.org/publicdomain/zero/1.0/deed.en)], via Wikimedia Commons, accessed September, 2016. Although Pitman was intended to be a summer resort, by the early 1880's Pitman began to attract a permanent population. Train service was good and Pitman became a suburb for people who commuted from Camden and Philadelphia. By 1895 there were about 100 families living in Pitman. The winter population of 1896 was approximately 1000. Another landmark in the growth of the town was the establishment of a schoolhouse. In 1884 the Pitman school district was created and the schoolhouse was built that winter. During the Camp Meeting of 1878 a visitor noted, "no longer were there white tents among the brush wood trees," furnished with haunches for seats and straw for beds." Instead there were graveled walks, a large store, 4 restaurants, a barbers shop, an ice cream saloon and about 300 cottages. Two weeks prior to the opening of the camp meeting strings of wagons delivered supplies, six trains per day arrived, and the cottages filled up. Services were held continuously from 5 a.m. to 10 p.m.
As the 19th Century ended, these factors were leading in the direction of self government for Pitman. There were problems with road repair and grading, which it seemed could not be solved by Mantua Township, which governed Pitman. In addition, residents had to travel to Mantua to vote and pay taxes. In 1903 a new paper, the Pitman Grove Review pushed for the incorporation of Pitman as a Borough. There was a feeling that Mantua Township was taking more money out of Pitman than it was producing in services. On October 20, 1904 the town held a meeting in the Knights of the Golden Eagle Hall, where it was decided 122 to 35 to petition the state legislature for incorporation. The petitioning committee included J. W. Newkirk, J. M. McCowan, and J. C. Rulon. On May 24, 1905 the petition was granted. Mrs. Lorraine Mollenhauer, Pitman Grove Historic District, Gloucester County, NJ, nomination document, 1975, National Park Service, National Register of Historic Places, Washington, D.C.